This Fruit Tea Loaf recipe also known as Tea Bread or Teacake is perfect served as part of an Afternoon Tea. The fruit is soaked in hot tea, to help plump up the fruit and infuse the flavour of tea. I used Whittard Earl Grey Loose Tea Pouch. Not only does this make for a fruity and flavoursome cake, best of all it is both a Fat Free Cake and Dairy Free Cake. It is quite popular to butter a slice of tea bread, which I think tastes particularly nice, however no longer fat free if you use real butter. This recipe is used greatly in my family and is a proven favourite. The original recipe is from an old magazine cutting. *you can use any fruit you like, sometimes I swap some of the prunes and figs and add dried apricots or cherries. Oven temp 190 or 170 fan, gas mark 5. Beat the sugar and eggs together. Bake in the oven for 1 hour, the cake is ready when a skewer pushed into the cake comes out clean. Allow to cool for 5 minutes, before removing from tin and cooling on a wire rack. It is always nice to enjoy a slice of Earl Grey Fruit Tea Loaf whilst still warm. Baking Tip - Perfect cake you can freeze. It is always worth cutting a few slices and placing them in the freezer. If you have used this recipe to make 2 of the 1 lb loaf, I cut one into slices and freeze it. It makes a fabulous slice of cake to get out the freezer for any unexpected guests, a few seconds in the microwave to defrost it leaves it warm and tasting fresh out of the oven. Or leave to thaw at room temperature. Will keep for a week in an air tight container. I am linking up to Love Cake with October theme of dark, perfect for the muscovado sugar and tea in this recipe. Also linking to #CookBlogShare at Super Golden Bakes. Disclosure - thank you to Whittard who supplied the tea. this looks so delicious, i want a fruit loaf with my tea now! Your tea loaf sounds delicious, especially smothered in softened butter. Like the idea of soaking in tea. I love a fruit tea loaf but I've never tried making one with Earl Grey tea before and I drink Earl Grey every morning! I also love the addition of the prunes and figs. I always have of them in the cupboard. Thanks for linking up. 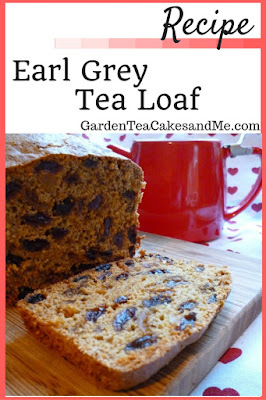 I must try this, although I make a fruit loaf I do not use Earl Grey tea or prunes or figs. It sounds delicious! fab sounding recipe definitely going to give it a go. This looks delicious, would it be ok to put butter on it before serving? The other half likes putting butter on. Nice to find this recipe. They sell it in John Lewis cafe, friend persuaded me to try it as I HATE earl grey tea but love this! What is in the mixed spice?